20% DISCOUNT FOR WEEK OF MARCH 30TH. Oceanfront two story beach home, located on east side of Sunset Beach. Large, bright open rooms with vaulted ceilings in living/dining rooms. 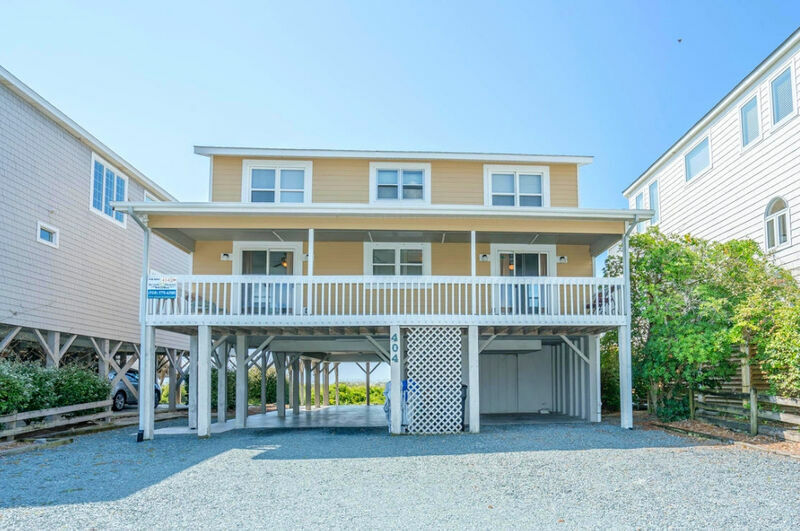 Sundeck and covered porches for relaxing, plus a picnic table for meals overlooking the ocean. Interior renovations winter 2018. New siding and deck railings for 2017. Amenities include central heat and air, 3 color cable TVs, (40", 37", 32"), 2 DVDs, hi-speed Internet access (DSL). All the expected kitchen appliances and a charcoal grill. Private outdoor shower and pathway from house to 4th Street walkway beach access. Bedding: Upstairs: King, Queen/Single, 1 Bath. [Downstairs: King, Queen/Single, 1 Bath. Portable full-size crib also available. Accommodates 10 people. Pet friendly with additional non-refundable pet fee of $150.00 per pet - 2 dog limit. Some dog breeds restricted, please inquire. The location makes this is the perfect house for a family vacation! The house is right by the ocean and a boardwalk, so it has a great location to get back and forth to the beach. The view from the house is spectacular-right on Main Street, you can see the sun rise and the pier right from the deck. You can easily get back and forth to the the beach, or view it from afar on a peaceful semi covered porch. It is just the icing on the cake (or sand castle) at Sunset Beach. This was definitely one of our better rental experiences. Very peaceful vacation in an excellent home. First time we'd gone to the beach in mid-May, so was windier and chillier than we'd hoped, but still worthwhile.